The good news with digital cameras is that it's so easy to shoot lots of photos. The hard part is then accessing and sharing them -- hooking up the equipment and software to transfer your images to a computer, and then going through the process of uploading them to the Web so that others can access them. Someday our digital cameras will have built-in wireless to do all this automatically, but until then you can use an Eye-Fi card -- a clever combination of a standard SD memory card with built-in Wi-Fi technology (see previous posts). Plug in the Eye-Fi card, and your camera can automatically transfer your photos to your computer over your home wireless network. Or there are versions that can upload directly to some 25 popular online photo-sharing sites, from home or when you're on the road at public Wi-Fi hotspots. But digital cameras also shoot video clips -- what about sharing them too? In March, Eye-Fi announced new Video cards with 4 GB of memory (in SDHC high capacity format) and the ability to upload directly to YouTube and Flickr. And now Eye-Fi has announced broader support for sharing videos with your photos, by also uploading to Picasa Web Albums, Photobucket, and SmugMug. So now you can immediately share your summer trips with friends and family -- automatically, and with no hassle. Whenever you're in range, the Eye-Fi card will connect wirelessly and upload your photos, and videos, to your online album. Easy enough? 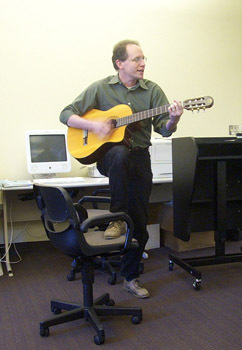 The Streaming Media East conference is back in New York this week for the 2009 edition. The event is held at the New York Hilton Hotel in the heart of the city (6th Ave. between 53rd and 54th Streets), as opposed to a big conference center, so it has a more personal and friendly atmosphere. There's lots going on -- last year the show had some 3,500 attendees, 100 speakers, and 60 exhibitors -- but at the some time there's also time to chat with other attendees, speakers, and exhibitors. The main Streaming Media East event then runs for two days on Tuesday and Wednesday, May 12 and 13. The technical program again features some 100 speakers, with the first keynote tomorrow by Paul Sagan, CEO of Akamai. Topics range from technical (Flash, Silverlight, encoding, video quality) to strategic (production, live feeds, advertizing / monitizing). On Tuesday, Dan Rayburn from StreamingMedia.com will present his ongoing work on CDN Research Data, and Jan Ozer is back to help with Streaming Production: Improving Your Video Quality (see post from last year). And the exhibits are open on Tuesday from 10 am to 6 pm and on Wednesday from 10 am to 4 pm. This is a great opportunity to spend time with the key players in streaming production and delivery, especially content delivery networks (CDNs) and associated products ands services. See the StreamingMedia.com site for show coverage. UPDATE: Presentations from the conference sessions and workshops are posted at www.streamingmedia.com/east. Many of the videos from the conference and associated Content Delivery Summit are available at www.streamingmedia.com/videos. UPDATE: Dan Rayburn posted a Show Recap, with links to summaries of show coverage by Larry Kless. Dan Rayburn gave his regular update on the streaming media market at the end of a busy day at the Streaming Media East conference in New York (see previous post). Rayburn keeps his fingers on the pulse of the market as executive VP at StreamingMedia.com and principal analyst at Frost & Sullivan. In particular, he talks with lots of customers who are pricing streaming services from Content Delivery Network (CDN) companies like Akamai and Limelight, and he kindly shares not only his insights, but also the real data, on his Business of Video blog at BusinessOfVideo.com. In the overall market, Rayburn sees "delivering bits" as a commodity business, with the need to differentiate by addressing the larger ecosystem of customer needs, focusing on high-end performance and scalability, or on supporting issues like asset transcoding and management. In terms of general trends, this past year saw a bump in video traffic as many content owners increased video bitrates from 300 Kbps in 2007 to 500 to 750 Kbps in 2008. For the next year, Rayburn expects technical impacts from more traction for HD video, progress in new approaches for video advertizing, and more emphasis on streaming live events. Download Rayburn's presentation on CDN Research Data (PDF). I've used LaCie external hard drives and storage devices for many years, based on functionality, performance, and a flair for design (see previous posts). That same emphasis on design comes though in LaCie's line of interesting and fun accessories. 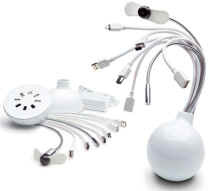 For example, the LaCie USB / FireWire Hubs have a distinctive design with polycarbonate round shape, glossy white finish, a variety of flexible cables for sharing connections and/or charging your portable devices. The USB & FireWire Hub even includes a USB fan and light ($79 USB 2.0, $89 USB & FireWire). And the LaCie Flat Cables are easy to coil up and carry without tangling, with bright colors -- and even come with 24 adhesive labels preprinted for common uses. 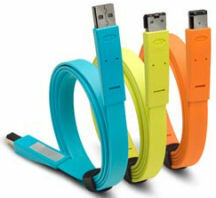 The line includes seven different interfaces: eSata (yellow, $12.99), FireWire 400/800 (orange, $12.99), and USB A/B/Mini (blue, $9.99), each around four feet. See my Peripherals and Accessories Gallery for more electronics accessories and PC peripherals. The march of progress in portable storage is creating interesting new problems -- Our growing collections of fingernail-sized memory cards with multi-gigabyte capacity challenge us to find convenient ways to access and carry all that digital data. LaCie continues to bring interesting features and design to its new products (see previous post), such as the LaCie itsaKey / imaKey USB drives in the form of rugged metal keys for easy carrying (see previous post). And now there's the LaCie Data/Share: a dual USB card reader / and USB storage drive for SD and microSD cards, for $9.90. You can use the Data/Share as a USB card reader -- just insert the card and plug in to your computer's USB port (the Data/Share has push/push connectors to fit cards securely and pop out easily). Or leave in the cards to use the Data/Share as a pair of USB storage drive -- perhaps one side with your private data, and the other with data to share. The Data/Share is made of hard plastic with rounded edges, and is not so small as to be easily lost (2.76 x 1.38 x 0.51 inches). It supports higher-capacity SDHC and microSDHC cards. My final example of LaCie's fun designs for accessories (see previous posts) are the LaCie Bus Powered USB Speakers, recently reduced to $29.99. These are stylish speakers for PC or Mac that conveniently plug in to your computer's USB port and just work. They're plug and play, with no additional drivers needed. And they're powered over the USB connection, so no additional AC adapter or batteries are required. The LaCie Speakers each roughly the scale of a softball (5.3 x 3.9 x 3.5 inches) and pack up nicely in the included carrying case, with storage under each speaker to wrap up the cables. They also include an audio input cable for use with a portable device like an iPod, and have a power connector to use an external AC adapter instead of USB power (bundled for $49.99). The LaCie USB Speakers are 1 W per channel (loud enough for a desktop, but not a concert hall), with 16-bit / 48 kHz processing. 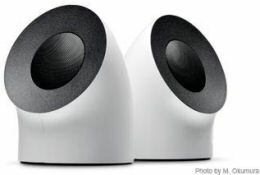 LaCie also offers FireWire speakers in the same design for $79.99, with 4 W per channel and 24-bit / 96 kHz processing. These are a simple and easy and classy way to listen to videos and music and games on your desktop or laptop computer, without extra cables and power bricks. Plus, with both Wi-Fi and mobile cellular broadband service, netbooks can provide the convenience of that connectivity almost anywhere, so you can access larger stores of your documents and your media files in the Internet cloud. But netbooks are not just competing with notebooks, they're also an alternative to smartphones / PDA phones that also provide Internet connectivity and personal data access on the go. Smartphones are easier to carry along in your pocket and are great for quickly checking e-mail or a website, but a netbook offers a larger screen and keyboard for more extended work (see previous post: Netbook or Notebook). So just as the cellular carriers offer discounted pricing for mobile phones and smartphones in the U.S., as long as you sign up for an extended service plan, they are starting to do the same for netbook devices. This week, for example, Verizon Wireless announced that it is selling the HP Mini 1151NR netbook like its other phones -- It's available for $199.99, after a $50 mail-in rebate and a new two-year activation on a mobile broadband plan. - Moderate plan - $39.99 / mo. for 250 MB allowance [~16 cents/MB], 10 cents/MB addl. - Heavy plan - $59.99 / mo. for 5 GB (5,120 MB) [~1.2 cents/MB], 5 cents/MB addl. But who has any idea how many megabytes they are using when accessing e-mail and attachments, or browsing Web pages with photos, much less audio or video? Verizon lists some approximate data usage examples, including: typical web page lookup at 300 kb, low resolution digital photo at 500 KB, and PowerPoint presentation (20 pages text & light graphics) at 3 MB. So on the order of 1000 Web pages, 500 low-res photos, or 100 PowerPoint presentations over a month would blow through the "moderate" plan. And downloading podcasts at 10's of megabytes and YouTube videos at 1/3 to 2/3 MB per second (see Jan Ozer in PC Mag) will add up even faster. As a result, looking for Wi-Fi hotspots is still important even when you have mobile broadband service, at least for doing large transfers and enjoying entertainment sites like YouTube and Hulu. The Verizon high-speed network service (EV-DO Rev A) also is slower than typical Wi-Fi service, running at DSL-like typical rates of 600 Kbps to 1.4 Mbps for downloads and 500 to 800 Kbps for uploads. Even so, it's great to be able to set up a netbook almost anywhere and be instantly online, doing your e-mail and checking in on the Web. Dell has updated its line of Inspiron Mini Netbooks, driving the starting price of the new Inspiron Mini 10v ("v" is for value) under $300. 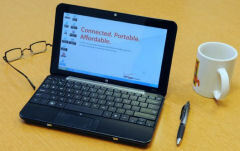 - The Dell Inspiron Mini 9 with 8.9 inch display starts at 2.28 pounds and $249. 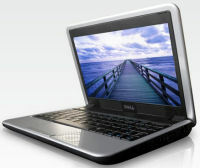 - The Dell Inspiron Mini 10, with 10.1 inch widescreen display, starts at 2.86 pounds and $349. - And the Dell Inspiron Mini 12, with 12.1 inch display, starts at 2.72 pounds and $399. It's cost-reduced with a slower Intel Atom processor and different video accelerator, no wireless mobile cellular broadband option, and a VGA port instead of HDMI. It's available with 1 GB of memory and 120 or 160 GB hard drive or 8 GB (Ubuntu) or 16 GB solid state drive (XP and Ubuntu). The Mini 10 also now can add an internal Digital TV Receiver (ATSC) for $20. As with the Verizon HP Mini offer (see previous post), in January Dell and AT&T offered the Dell Mini 9 bundled with a two-year AT&T LaptopConnect agreement for $99 (regularly $449, after $350 mail-in rebate). Expect to see more of these in the future. Again, these netbooks can feel a bit sluggish compared to high-end laptops, especially when you are multi-tasking, but on the other hand you can do real computing and Internet connectivity (including watching Internet videos on Hulu) with a device as small as 9 x 6 x 1+ inches and under 3 pounds. 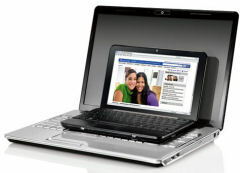 See my Portable Communications Gallery for more detail on Dell and other netbooks. Entries posted to Manifest Tech Blog in May 2009, listed from oldest to newest.